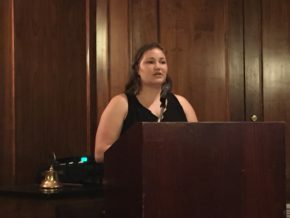 Kiwanis of Lafayette thanks Ashley Myers, Regional Outreach Coordinator with Prevent Child Abuse Louisiana (PCAL) for speaking to us today. Since 1986, Prevent Child Abuse Louisiana has been dedicated to accomplishing their mission of preventing the abuse and neglect of Louisiana’s children. From help with potty training to keeping kids safe from sexual abuse, PCA Louisiana supports parents and children through intensive, evidence-based programs and community-based education. Ashley spoke of the various programs that PCAL puts forth, including Kidline, a toll-free crisis, support and intervention hotline that provides referrals to community resources throughout the state of Louisiana. She also spoke about programs for parents to learn better techniques to avoid both mental and physical harm to children. Thank you, Ashley Myers for speaking about the important mission of PCAL.